A huge thank you to Family Christian for sponsoring today's recipe! All thoughts are 100% my own. "When life gives you lemons, make lemonade!" We've all heard this expression, right? It's probably right at the top of the list of most used cliches. And I must admit, it's a pretty good one. What better message is there? When life gets tough, make the most of it. Learn from it. Grow from it. Despite the cheesiness, it makes sense. But sometimes, it's not just us that turns our negatives into positives. God loves taking those tough moments and using them for the better. He uses them to strengthen our faith. He uses them to help us grow closer to him. He uses them to remind us that we are not alone. Perhaps you've seen this in your own life. I know I certainly have. I've had my fair share of moments where everything seemed to be going wrong- the plans I had so carefully planned out were falling away and I was left wondering WHY ME! There was the high school love that I was sure was 'the one'. I prayed and prayed for it to work out, but God said no. It was devastating, but through it, I learned to be stronger and how to recognize real love when it came along. It prepared me for my now husband. There was the dream college that I was admitted to, but could not afford. Again, heartbreaking... but had I been able to go, I would never had the chance to meet my husband and start our family when we did. I would not have the best job in the world- being mommy. I would not have my son. There were the deployments, an inevitable but difficult part of military life. Moments I wasn't sure I would be able to handle, but that in the end made me realize I was stronger than I could ever imagine. They made me into a stronger mother, a stronger wife and a stronger woman. There was the heartbreak of a miscarriage, a loss I still feel... but without which I would not have my amazing rainbow baby Finley- the sweet girl whom we could not imagine our life without and whom we know was the child that God had intended for us all along. There was the unexpected transition out of the Marine Corps... a challenge we are still dealing with, but that has given us the opportunity to put down some roots and truly be together as a family and stay in a place we have come to love. You see, all of these tough moments are certainly that...tough. They're stressful, they're annoying and honestly, they just really stink. As humans, we have the desire for things to go our way- to work out as we hope. But the good news is, even when things don't work out according to our own plans, they ALWAYS work out according to God's plans. And his plans are always much more than we could ever hope for ourselves. 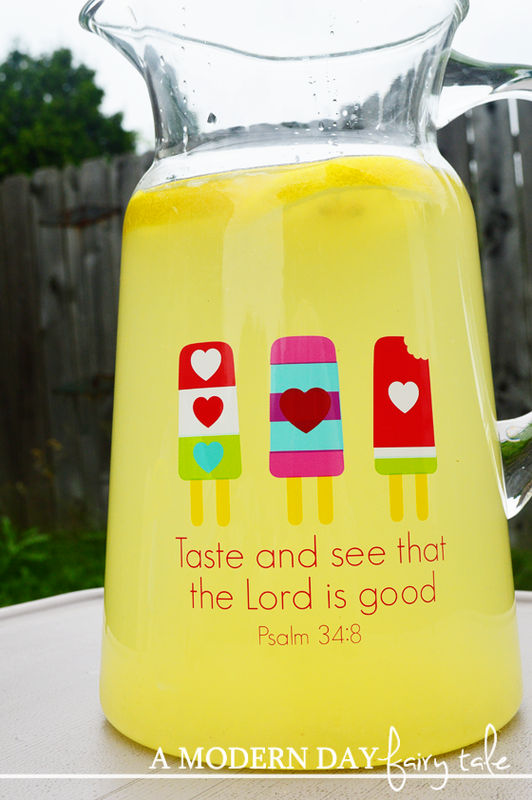 When life gives you lemons, taste and see that the Lord is good! Of course, we can still drink lemonade! 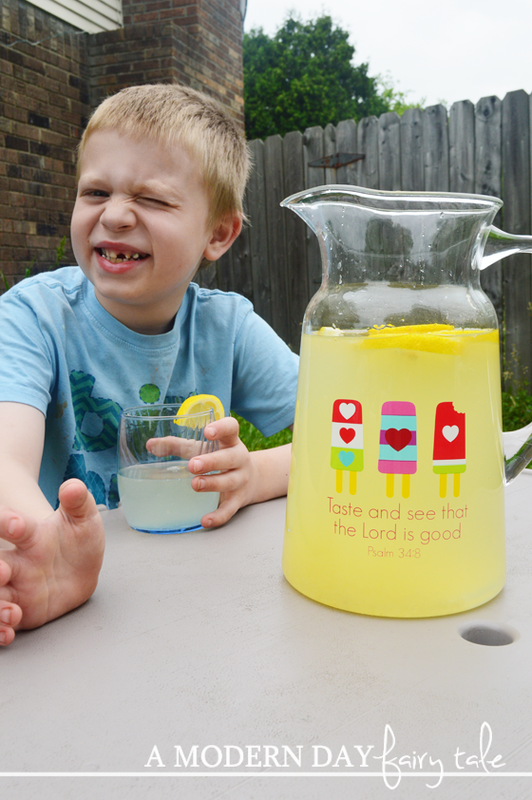 To celebrate the goodness of God, today I am sharing my delicious homemade lemonade recipe... the most delicious lemonade you will ever taste! Enjoy! Bring to a boil, stirring until sugar has dissolved. Allow to cool to room temperature. In a pitcher, stir together the chilled syrup, lemon juice and remaining water. Serve over ice with lemon slices. 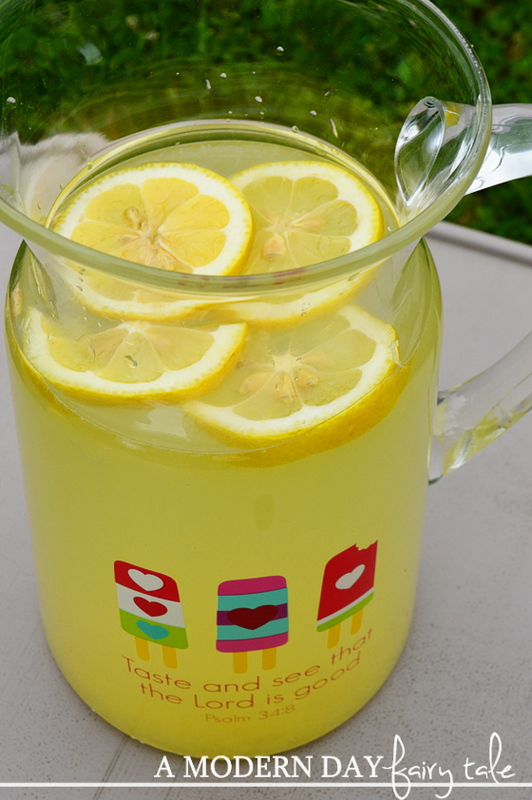 This lemonade is so delicious it will be gone before you know it! Love the pitcher used in this post? Great news! It is available at Family Christian- in store and online and is currently on sale for 40%, along with the rest of the Summer Picnic Kitchen Collection! Stop by and check it out today! I really like the saying on that pitcher. I love a good, tasty glass of refreshing lemonade. There have been several situations in my life that were hard but God always had a reason for them, and they turned out to be good in the end. Like you said, it's HIS will. I love your change :) The lord is good and sees us through all!! 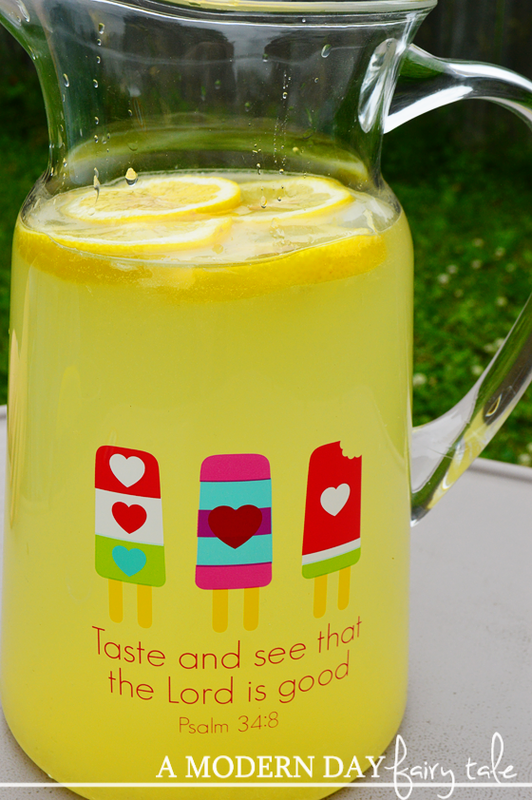 Altho a great glass of lemonade is a great companion to it ;) Thanks for the fabulous recipe!! Can't wait to try it!! 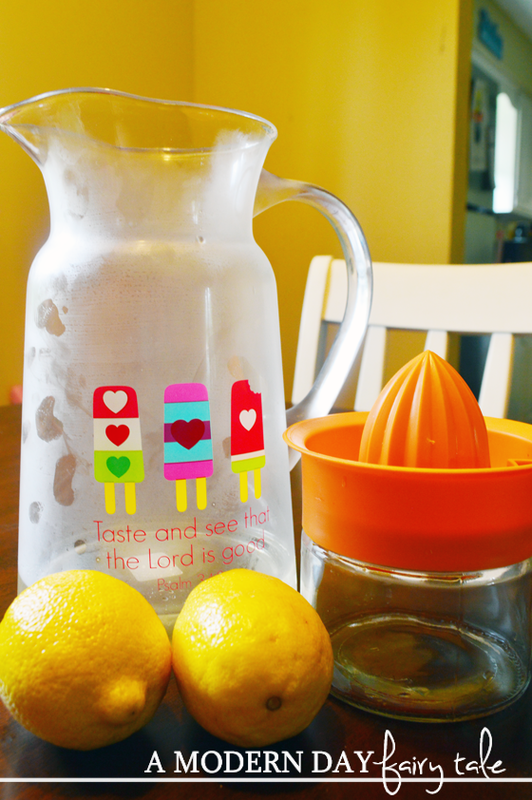 That pitcher would be perfect for my house and I love a good lemonade recipe! Nice recipe! And it is easier looking back many years to see that sometimes the lemons are blessings in disguise, sometimes really sad things are character building, some we don't have an answer for with our own understanding. But often, there is a blessing if you look for it! To start with some fundamental data about how payday advances function. Suppose that you have to obtain some cash to pay a late bill. You won't land paid at your position for a moment, up to two weeks. Shockingly better, not at all like a vast bank's endorsement procedure, this kind of advances are offered to individuals regardless of the possibility that they don't possess security. A ton of times, payday is the greatest day of the week or month since you feel just as you have enough cash to go eat at your most loved eatery or basically have a conviction that all is good.